Making traditional strudel dough involves intense kneading, pulling and stretching. This beginner's version is much easier. 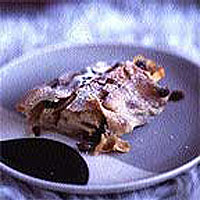 The day before you want to serve the strudel, mix the sultanas and raisins for the filling with the Calvados and set aside. To make the dough, sift the flour and salt into a bowl. Make a well in the centre. Beat together the egg, warm water and oil and pour into the flour. Mix until it forms a soft dough - you may need to add a little more flour if the dough is too sticky but don't make it too dry. Tip out on to a clean surface. Knead and stretch the dough until it feels smooth and very elastic. Return to the bowl, cover and leave to rest at room temperature for at least 30 minutes. Shortly before baking, preheat the oven to 190°C, gas mark 5 and lightly butter a baking sheet. Mix together the sugar, cinnamon and Calvados-soaked sultanas and raisins. Peel, core and finely slice the apples and mix into the sugar mixture. Liberally flour your work surface. Roll out the strudel dough to an oblong shape and carefully lift on to a clean, floured tea towel. Dip your hands in flour and start to work the dough by pulling and stretching it from the underside, gently pulling it in all directions. Don't let the dough fall back on itself or it will stick together. Don't worry if you get the odd hole but don't let it turn into a string vest! The strudel dough is ready when it is about the size of the tea towel and thin enough to see the pattern through. Brush generously with ¾ of the melted butter. Spread the apple filling over the front half of the dough, keeping a 5cm border at the edge nearest you. Then pick up the two nearest corners of the cloth and roll up the strudel, rolling away from you. Flatten the two shorter ends and trim away the edges taking care that they are well sealed. Slip it on to the baking sheet and curl into a horseshoe shape. Brush all over with the remaining melted butter and bake for 20-25 minutes until crisp and golden. Liberally dust with icing sugar and carefully lift on to a serving dish. Serve hot, warm or cold, cut into slices, with lashings of cream.